Noise coming from kitch-hen ::flip, rustle, rustle, rustle:: Mum comes to kitch-hen to find the top of the trash can up! Oh say can you see a big kittie checking out what is in the trash can? Oh, yeah, it is me, looking for those chick-hen bones from the other night and the plastic thingy I like to chew on. 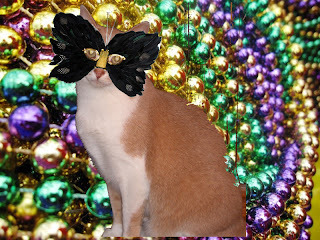 But I was thwarted in my quest, mum picked me up and said I was "BAD, BAD, BAD KITTY" and dropped me to the floor. I growled back at her. Phooey. Then she emptied out the trash anyway, it is trash night tonight. Then put a big heavy thing on top, so I can't get it it now. BUMMER. Guess I will go and nap. 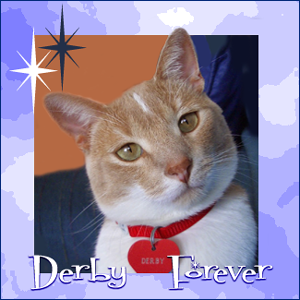 February 28, 2006 was the first day I showed up on Derby's blog. Little did mum know at the time what she started when she brought me home. Now lots of you have loving homes throughout the blogosphere, we even adopted Flurries one of the winter virtual Squillions. Flurries and I get along just fine, no fights or wrassling matches. Well, we are girls, that might make a huge difference. I am looking forward to my Garden Thursday updates. If we look outside we are beginning to see signs of spring coming. I can't wait for warmer weather so I can get back out in the garden. 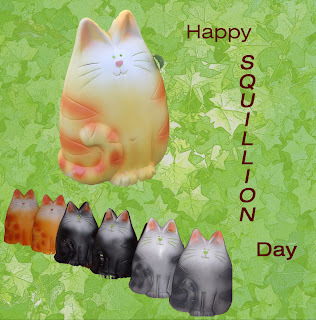 Happy Tuesday, Happy Squillion Day! Well after our snow-prise the other day, it is melting quickly. It was so nice on Sunday that mum even opened the windows for a while. Even with our nice winter this is the first time mum has opened the windows for us. Derby got to the open window first, me waiting. I can't wait, I jumped over him to sit near the open window, but he didn't like that. Mum went to open the other side. So I will go over thee and sit. Much better, we each have our own open window. We switched sides after a while. Here is a snow report, lot of sunshine and some warms, so it it melting pretty fast. Can you pick out the little bits of tulip leaves starting to come up? Farther down the front of the house, the daffodil leaves are starting to push out of the ground too. Gull and flower boxes showing a lot less snow. Evergreen trees are almost clear of snow too. Mum took a picture of the maple tree, you can see the buds starting to swell up. That means spring is coming. Hurry up spring! Don't forgets that tomorrow is Squillion Day. Virginger will make an appearance. When we left you last night the snow machine hadn't started and we weren't expecting much. Well "Snow-prise"! The weather guessers changed their mind and we actually got some of the most snow! We got around 6-7 inches. The bird bath in the back early in the morning. The back yard from the back door. Our fake gull covered with snow. The flower boxes all full of snow. Afternoon and a picture of the same bird bath as the first picture. The streets are dry and clear. Most of this will melt in a few days. Us snoopervising mum at the puter. Get our post done, then you can have dinner. Yep, we checked it is Thursday. The weather guesser keeps saying it was going to snow today. So far no snow flakes and mum even checked by turning the light on outside to be sure. We got surprised yesterday. We were both napping in the sun on the front window perch, when mum pulled into the driveway. What the heck are you doing home from day hunting so early? Well she had an appointment and had time to stop home, drop off the work stuff, brush her teeths, put some lipper stick color on and back out the door. Then we didn't see her until dinner time. Oh, well tomorrow is Friday, then the weekend! Yipee for us all a weekend. 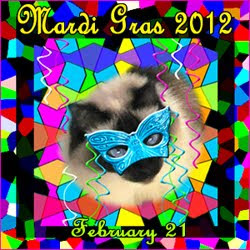 We are all ready to pop off to the parties for the end of Mardi Gras, or Carnivale as it is called in some places. The gang at Jacqueline's Cat House challenged us to join in the fun. We did. 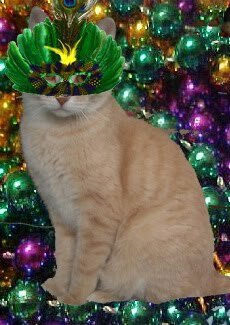 Mum found us bead and masks. Masks made with fevvers. We want to play with them as much as we want to wear them. BTW, we realized we missed ManCat Monday. But mum was confuzzled as she kept thinking, since she wasn't working on Monday, that it was really Sunday. So we blame her. Mum finally got my vet visit video to load. See below for more details. Derby saying farewell to me, just before mum put me in the metal monster. Waiting to go into the exam room, we only had a few minute wait. First appointment of the AM. Miss Liz checking my weight. Good spot to sit while we had a few before Dr M came in. My weight. A nice 8 pounds 9 ounces. Good for a little guy like me. Mum got a pic of what they would shoot me up with! Moment of truth, but I didn't jump or meow! Ready to head for home. Mum thought she heard me hiss softly as we waited. Yeah, I don't care for this. Once home, mum let me out of the PTU and I ranned to the dungeon for a few minutes. Derby followed and chased me, but that only lasted a few minutes. Now we are ignoring each other again. Mum gave me some extra cuddles too. I hopes the rest of you have a good weekend. Mine will be improving since I am back home. We forgots to mention this earlier, but this weekend is the weekend everyone can count fevvers and report them! You can go here to find out exactly what to do, but simplest, is spend 15 minutes over the next four days counting fevvers. You can count anywhere, at home, at work, out in the park at play. This helps all the science guys and gals learn where all the birds are. We officially count fevvers every weekend for Project Feeder Watch, but we got started by doing the GBBC! So we will be napping and watching all weekend. We get a mum day on Monday, she doesn't have to go day hunting that day. Oh yeah. Mum got older today. She says another year closer to being tired. Oh that's retired! 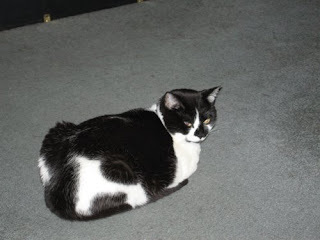 Derby sending deep purrs and meows to my heart throb The Princess Mia Bella. She actually asked me to be hers a few years ago. I like a lady cat who knows what she wants and goes for it. Isn't she just the lovely-est tuxie! She's my Tuxie Cat of Texas! Ducky here, ::sigh:: what can I say about my little sweetie Dora. I fell in love with her from the minute I saw her when she was just a little kitten. I patiently waited for her until her mum said it was OK for her to have a boycatfriend. 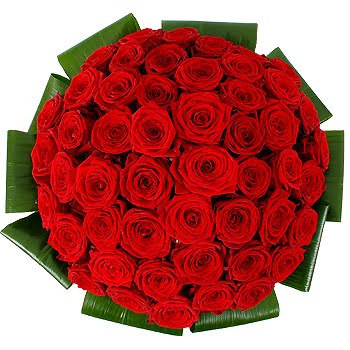 Sending so much love to you. Stay warm you floofalicious babe! Happy Valentines Day to mum and all of the rest of you too. HiYa, Ducky here. It is my two year gotcha day! I am so happy that I was gotted on this day two years ago by mum. Having had a different home before this one, I wasn't sure what it would be like. Would it be the same as the first one, different? If different, better? Oh yeah, it is better, WAY BETTER. Mum loves me and I loves her right back. I get treated nice, lots of noms and treats. Toys to play with, warm and snuggly places to nap. I even sleeps on top of her at night! 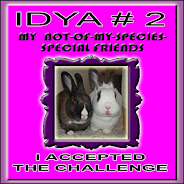 Ifs you want to read my first few posts and my past story, go back to Feb 2010 and March 2010. I must be a good host, so their are special noms and drinks for you to eat.